The Dual Overlay Heatpak is a free-floating system designed for use over the foil heating mats. It provides a smooth and seamless subfloor making it suitable for soft and resilient floor coverings such as carpet, vinyl and linoleum. Installation is quick, clean and dry making it an easier option for installers as there is no need for self-levelling. The low heat resistance allows heat to pass through the floor finish without any reduction to the efficiency, evenly distributing the heat and alleviating any hot spots. 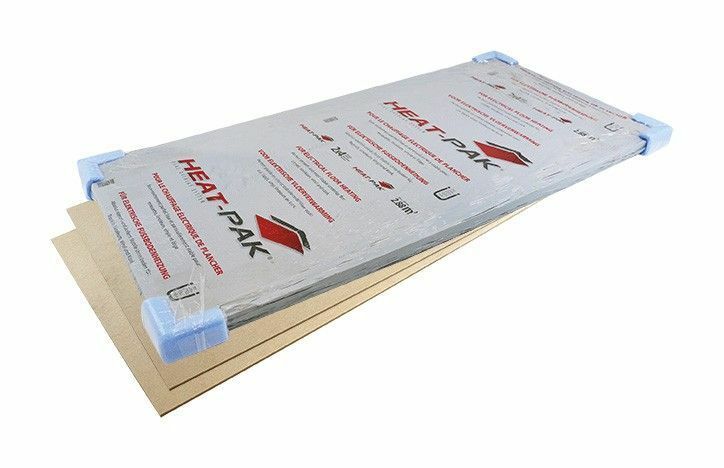 The Dual Overlay Heatpak consists of a base board and a top board. Both boards are provided with a contact adhesive, bonding them together to make one solid subfloor, to which a variety of floor coverings may be fixed. Please Note: when the overlay system is used with carpet the combined TOG rating of both underlay and carpet cannot exceed 2.5 TOG. Warmup Dual Over lay is not recommended in wet areas such as bathrooms. The Dual Overlay is a floating sub-floor. It is not fixed to the floor below. Each layer is laid out with staggered joints and arranged so that the top boards overlap the joints in the baseboards. Baseboards are thinner and have a protective plastic film to keep the self-adhesive coating clean. This is laid facing upwards and the film is left in place until cutting and fitting is completed. The top boards are thicker and have no plastic film over the adhesive coating. The first row of baseboards is created by splitting boards in half lengthways and turning the cut edges towards the wall. Leave an expansion gap of 8-10 mm all around the perimeter and around pipes and other fixed objects, this also applies to the final floor finish. Boards in the second row are laid out in the same direction as the first row. Start by cutting a board to 1/4 of its length and place this piece, with the cut end to the wall, next to the first row. Now place a full sized baseboard end to end with it and alongside the first row. The large off-cut will be used to start the third row of baseboards. Do not remove the protective film at this stage and keep the job clean and free from dust. The top boards are laid in the same direction as the baseboards, but with the adhesive side down. The first board of this row is full size and positioned into the corner overlapping both the first and second rows of baseboards. If the board fits neatly into the corner no trimming is required, in which case it can be lifted out and the plastic film can be peeled back from the baseboards that it will cover. Avoid removing more film than is necessary to accommodate the top board on the adhesive. The top board is carefully repositioned and adjusted for alignment, at the same time the baseboards should be checked for any gaps and adjusted if required; finally the top board is fixed in place by tapping down with the rubber mallet. For the best result it is important to keep the joints between the top boards as tight as possible. The easiest way to achieve this is by starting the second row of top boards with a half-length piece, followed by a full board and pushing all the edges tightly together before tapping down. Adding further boards, alternately, to the first two rows keeps the lines straight and so prevents gaps from developing. Due to possible influences of air humidity, glue the floor covering on the Dual Overlay no later than 48 hours. Every room should be fitted separately, leaving an expansion gap of at least 8 -10 mm and 16mm in door openings when Dual Overlay is continued in the adjoining area. If the floor covering is to be glued onto the total surface and should not to exceed the edges of the Dual Overlay Boards. This method of installation will provide a stable surface for the floor finish to rest on and avoid any joints showing through the final floor finish. Now you have installed the Dual Overlay boards you can either glue your final floor finish to the boards as a final layer or simply lay it freely upon them. Before installing the final floor finish test the foil heater(s) and floor sensor to ensure that no damage has occurred during the installation. This method of installation will provide a stable surface for the floor finish to rest on and avoid any joints showing through the final floor finish. Now you have installed the Dual Overlay boards you can either glue your final floor finish to the boards as a final layer or simply lay it freely upon them. Before installing the final floor finish test the foil heater(s) and floor sensor to ensure that no damage has occurred during the installation.